The biggest dilemma when planning a round the world (“RTW”) motorcycle expedition is the balance between carrying all the kit (you think) you might need and keeping weight to the bare minimum. If you are going to ride off the beaten track on surfaces like sand, mud and gravel, and that’s what adventure riding is about, you need to keep things “light”. At the same time you need to carry all the tools, equipment, spares, provisions, clothes, camping gear and everything else you will need to live out in the wilds in every climate and in every weather condition Planet Earth has to offer. Choosing the correct motorcycle is usually the biggest decision and this comes down to budget, riding ability and more often than not … just personal preference. In recent times RTW riders have circumvented the globe on nearly everything on two wheels: 105cc Australian “Postie” bikes; 50cc mopeds and scooters, classic adventurers like the Honda Africa Twin and Yamaha XT 500; and of course the BMW GS Adventure series bikes used by Charlie Boorman and Ewan McGregor on their Long Way Round and Long Way Down television productions. 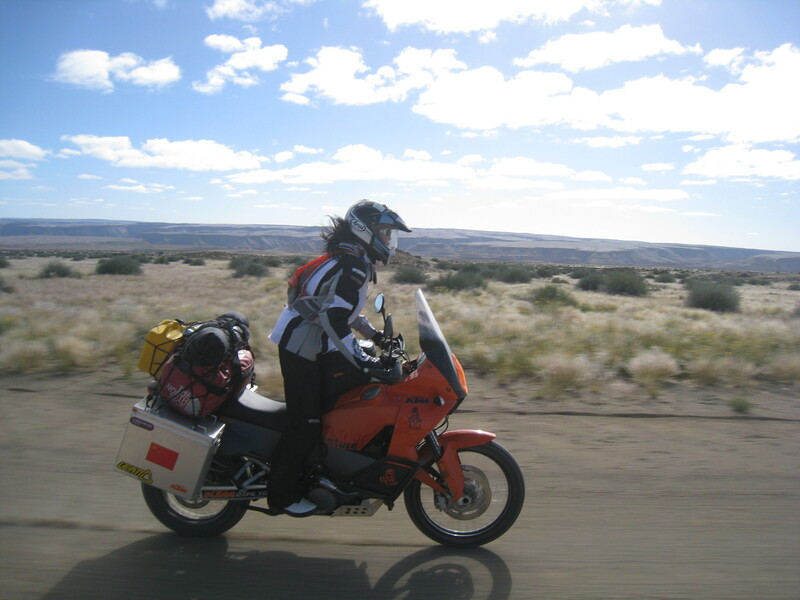 The decision for me was made in 2007 when I first had a chance to test ride the most popular adventure bikes around at the time for a solo expedition of southern African. As a fairly experienced rider of sports motorcycles, like the Yamaha R1 and Honda Fireblade, I had come to expect a bit of speed and excitement and after test riding the adventure bikes from BMW, Yamaha and KTM, only the KTM 990 Adventure left me with a huge grin from ear to ear, a grin that was to last for many months as I rode across the deserts, bush, game parks, rivers, gravel tracks and tar roads of South Africa, Namibia, Angola, Botswana, Zambia, Malawi, Mozambique, Swaziland, Lesotho and back to South Africa..
My KTM handled beautifully, was fast, powerful, reliable, balanced, looked the part and with Akropovik exhausts sounded glorious. Of course KTM were dominating (and have continued to do so) all the motorcycle rally competitions around the world, including the famous Dakar Rally and so my decision back then was an easy one. 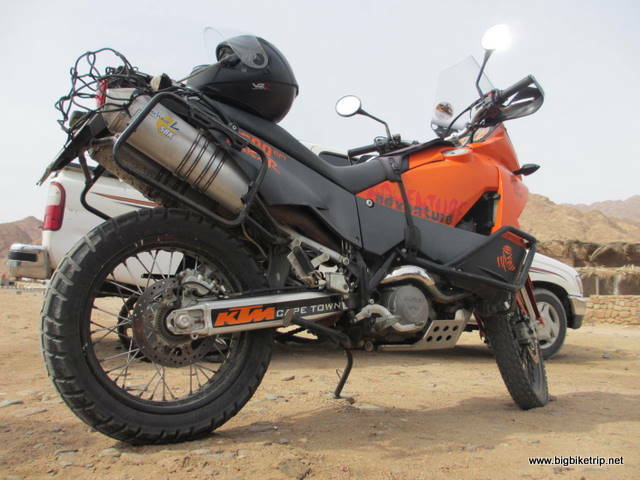 Fanny’s 2008 KTM 990 Adventure… never missed a beat … except when it was upside down in the Namib Desert and even then the engine was still going. Leo Vince exhausts without baffles… a safety feature …. get out the way we’re coming through. 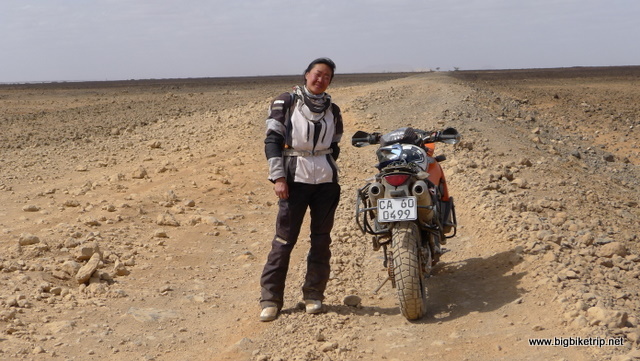 When Fanny and I decided to do our “Big Bike Trip” expedition in early Spring 2011 she had just learnt to ride and was honing her skills on a Kawasaki KLR 650, an iconic single cylinder dual purpose motorcycle. Quite cheap, simple design, reliable, and solid. In South Africa at that time they were being sold new for about 56,000 Rand. With a few thousand Rand spent on upgrading rear shocks, fitting better and lighter exhaust systems and putting on some Metzler Karoo tyres they are almost perfect for any RTW expedition. In fact, the KLR is a very popular motorcycle in the United States and has an almost cult following. The US military uses KLRs with engines modified to burn military-spec fuels including diesel. 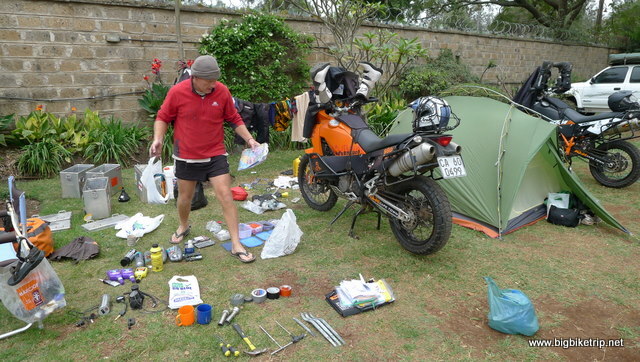 Kit audit in Nairobi…Searching Fanny’s panniers for contraband hair conditioner. Our “Big Bike Trip” expedition was to be the adventure of a lifetime for Fanny and I. We wanted to see as much as possible, experience as much as possible and enjoy the freedom of riding everyday in new and exiting places. When we started we had no sponsorship, no financial or logistical support, no one was giving us anything for free and so we had no allegiances to any particular product or manufacturer. For obvious reasons it made sense to ride two similar bikes (spare parts, tools, servicing, riding equilibrium, pace etc). Also, it would have been a terrible waste to have made any compromises as regards to reliability, performance and most importantly, fun. How about a BMW? There is no doubt they are good bikes with superb after sales support and a huge following, but to my mind they are just too clunky, too agricultural, too heavy and what is it with those lumps of metal sticking out the sides of the engine waiting to be dinked into trees and rocks, or smashed into my shins. 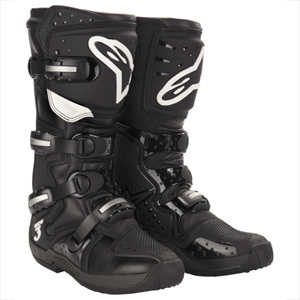 The smaller GS 800? Not bad.. it ticks a lot of boxes. However, I am far too young and handsome to be riding a BMW. I’ll get one of those when I take up golf or lawn bowls. How about a Triumph 800 XC? Very nice engine, but unproven reliability as a RTW bike and it has a strange (to me) riding position. Yamaha? The 1200 Super Teniere is very heavy and ridiculously expensive for what it is and the lighter XT 660, a very competent dual purpose bike, turns out to be even higher in the saddle than the KTM, and also rather expensive. My mind, body and soul wanted the KTM… but what about Fanny? A powerful and big KTM 990 Adventure for… (lets be bluntly honest)… a women with extremely limited motorcycling experience? It had to be Fanny’s call and so I did my best to present an objective “pros and cons” assessment on all the available options. Her decision was emphatic …. a KTM…. and an orange one. Extras – Touratech belly pan, panniers, crash bars, Oberon clutch slave, Scott steering dampner, heated hand grips, Touratech hand guards, ergo seat, headlight protector, touring windshield and rally windshield, Garmin Zumo 220 GPS, Akropovik titanium exhausts, high spec chain… ready to race… or at least ready to ride around the world. 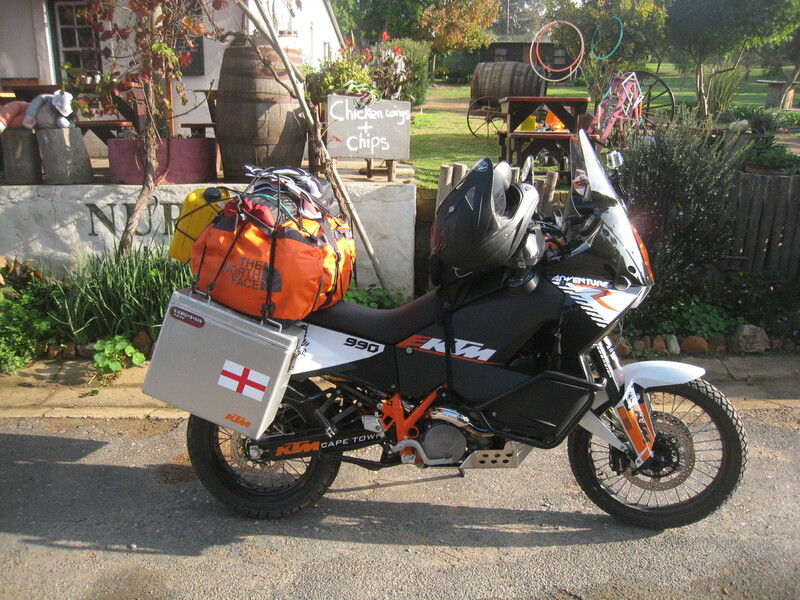 Fanny’s bike… a KTM 990 Adventure (2008). Pirelli Scorpion MT 90 A/T front and rear from Arniston up to Nairobi. From Nairobi onwards the front tyre (only) was replaced with a Pirelli Rally Cross MT21 which gave more stability and grip in the sand, mud and gravel of Kenya, Ethiopia, Sudan and Egypt. The rally cross tyre on the front is a softer compound than the rear and so the tread “Knobbly” sections start to become wedge shaped, especially after riding fast on tar roads. To extend the life the front tyres need to be taken off half way through their life and turned around the other way (against the arrow). We carried the standard Pirelli Scorpion MT 90 A/T on the back of our bikes and put them back on the front after we reached Alexandria in Egypt. Two sets of tyres front and rear got us all the way across Africa to Italy, the home of Pirelli, where we got our third set of tyres for the rest of Europe. 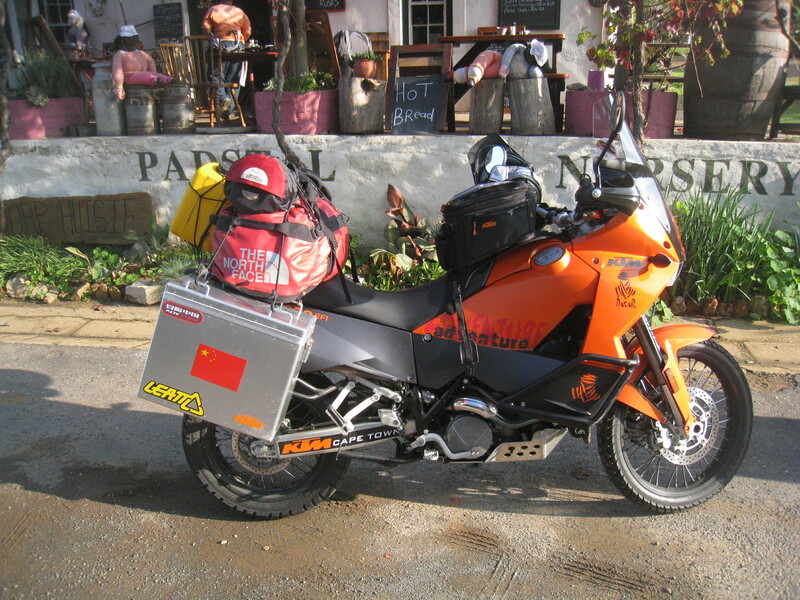 It seems a 50/50 tyre (such as the standard Pirelli Scorpion MT 90 A/T ) on the rear for endurance and traction and a rally cross tyre ( such as a Continental TKC 80 or Pirelli Rally Cross MT21) on the front is the perfect combination for crossing Africa, Mongolia, Tibet or any of the classic semi off road cross continent routes. Whilst very good for traction, putting a rally cross tyre on the rear would not last long on a powerful adventure motorcycle, perhaps just 3-5,000 kilometers, depending on how your rode. 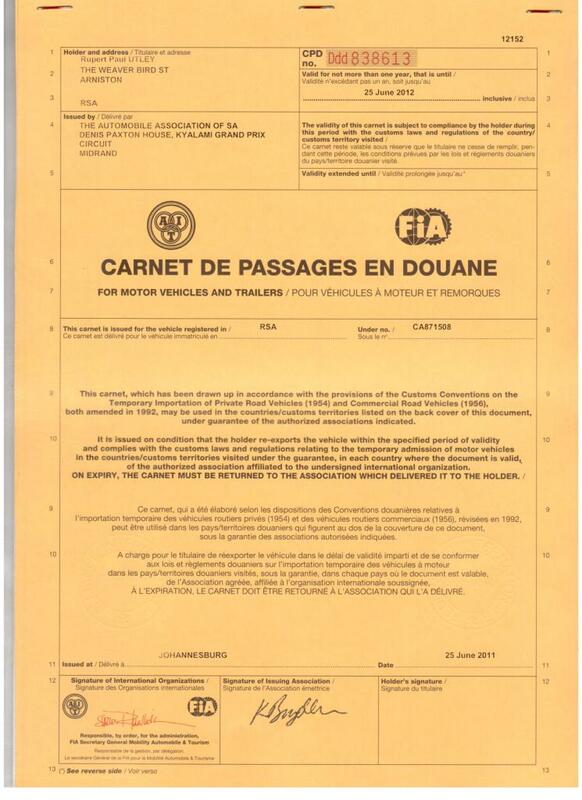 If we had done this we would have gone through three to four sets of rear tyres in Africa alone. Pirelli Scorpion MT90 A/T. 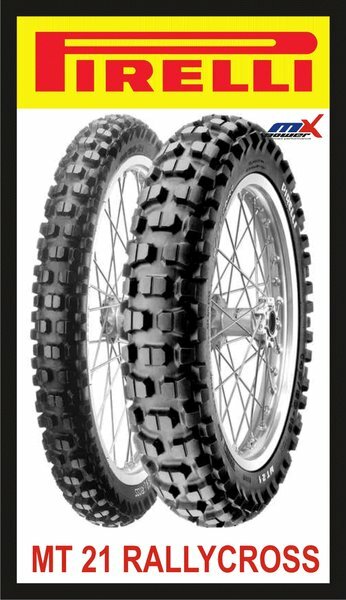 These are 50/50 tyres that come standard with the KTMs and are perfect for the dual purpose of proper adventure motorcycles. High quality, good performance, long lasting and allow fast and safe handling in most conditions. We only used the MT 21 Rally Cross Tyre on the front. When riding on the dreaded sand, rocky off road sections, or worst of all… slimy mud such knobbly tread tyres give the front end of the bike much more traction, stability, confidence and better handling. Much less likely to slide away on sand. However with a softer compound and less surface area they do not last as long. 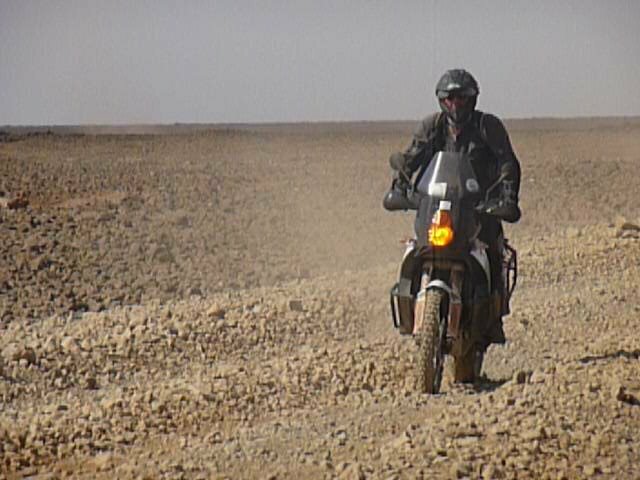 However, the front tyre of an adventure motorcycle usually last a lot longer than the rear and so it balances out. Chinese brand thermal underwear set (90 RMB) – replaced with superb Rev’It base layers from Italy onwards… perfect for the sub zero temperatures of the Dolomites and Alps. A beanie and several caps. 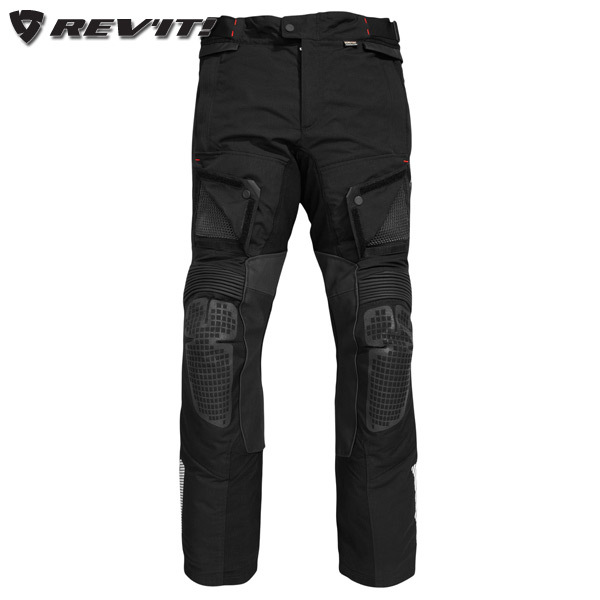 Replaced in Italy with full Rev’It Defender GTX jacket, trousers and base layer – kindly donated by http://www.527motor.com in Beijing. Superb kit. Chobe Safari Lodge beanie hat (birthday present from Fanny) as KTM beanie lost in Botswana. The KTM tackling the rocky deserts of north Kenya…the KTM 990 Adventure has the best power to weight ratio of any adventure bike… and best chassis, engine, suspension and balance. 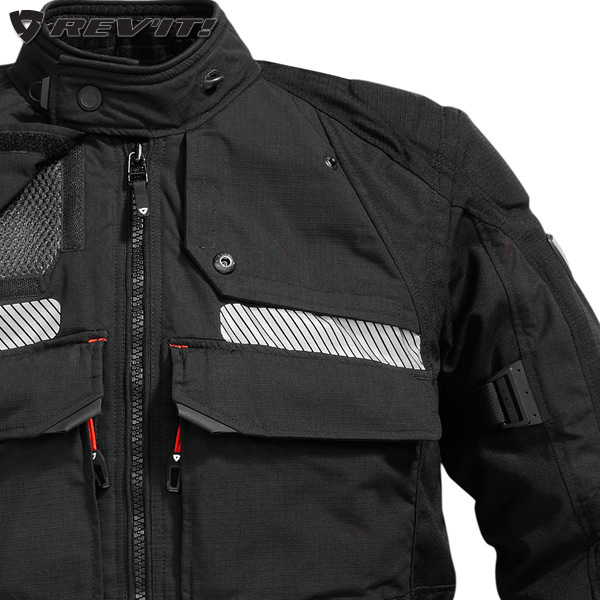 Keeping warm under the adventure bike clothes… we now have Rev’It base layers .. Outstanding kit and very warm and comfortable. 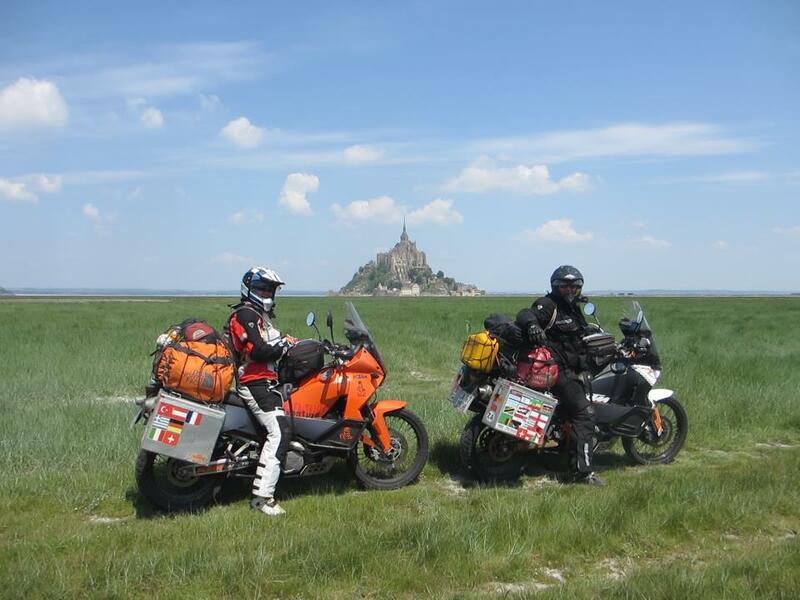 Both bikes taking a short cut to Mont St Michel in Brittany. Fully loaded off road was no problem. Thermal Comfort inflatable mats (South Africa brand) – 7.5 cms deep… Very comfortable while they lasted, but they became porous from Kenya onwards and required blowing up often in the night ….. a bit annoying… We should have invested in more durable mats with life time guarantees such as “Thermarests“. Generic brand sleeping bags (three season), which were replaced with our The North Face equipment we were given for China leg of expedition which were exceptionally warm and comfortable for the sub zero conditions on the Tibet/Qinghai Plateau and Himalayas. Panniers off and loaded onto RTW Dutch adventurers driving in bread van “the Wobbel” that kindly carried our fuel and water across this stretch of desert. – Sea to Summit Thermolite 15 degree sleeping bag inner linings. – cheap inflatable pillows… seems like a luxury but again getting a good nights sleep makes a huge difference on such a long expedition and they were light and small. – Two Chinese head lamps – bright, fairly cheap – but they went through AA batteries quite quickly. However, in middle of nowhere head torches are essential in the night. 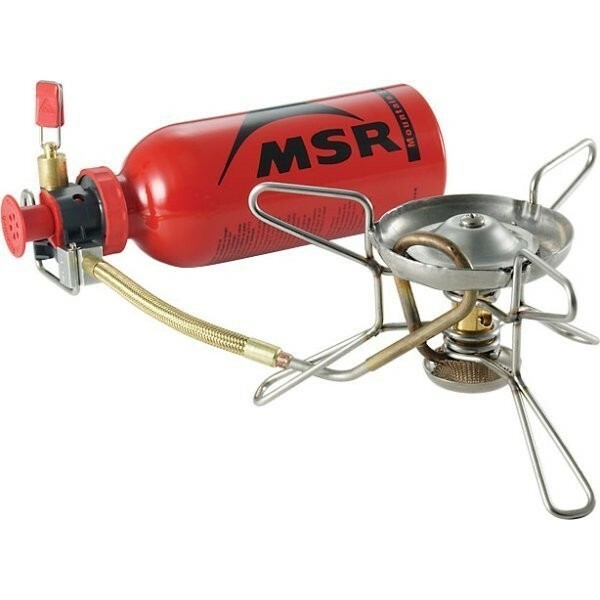 – Cooking equipment – MSR whsiperlight petrol cooker and petrol canister, light pots and pans (bought in SA), knife, fork and spoon set (bought in China). Plastic orange bowl and mugs bought in SA. If you can afford invest in the light and compact titanium cooking pans and utensils. I think its worth it over the long run. Vaude MKII Light with KTMs. Camped up at Mountain Rock in Nanyuki on the equator in the foothills of Mount Kenya where it rained pretty much everyday. 10 litre fuel tank on back of bike in Ethiopia where petrol stations were few are far between. In Malawi there was fuel shortage and we carried 20 litres in old cooking oil drums. A KTM 990 Adventure has a 19.5 litre fuel tank, but ideally needs an extra 10 litres to extend range from current 250-300 Kms to 400-450Kms.. so I carried a 20 litre can (ex Exide battery acid can found in Nairobi) on the back of the bike (not always full); and Fanny carried a standard 10 liter fuel can (used on previous trips). We started with two petrol cans but one fell off Fanny’s bike on the potholed roads in Zambia and was never seen again… hence the purloined 20 liter Exide battery can that lasted until the tough Moyale road in north Kenya where it developed a friction hole and started leaking fuel onto the hot exhaust. Not good. If you can get a range on your motorbike of 500 kilometers anywhere on this planet you will be OK.
One set of KTM issued bike tools (no need to bring two sets as both of our bikes are the same) , an assortment of small spanners, a socket set and screw drivers, alun keys, micro screw driver set, a hammer (lent to us by South Africans in Namib desert to reshape bent panniers and one day will be given back if we find them again), locktite, a piece of rope, 10 meter towing rope carried by Rupert, a chain cracker and spare links, 4 long tyre levers (very useful), puncture repair kit, spare torch, WD40, various glues, a multi -meter, and 12-240v converter canister. 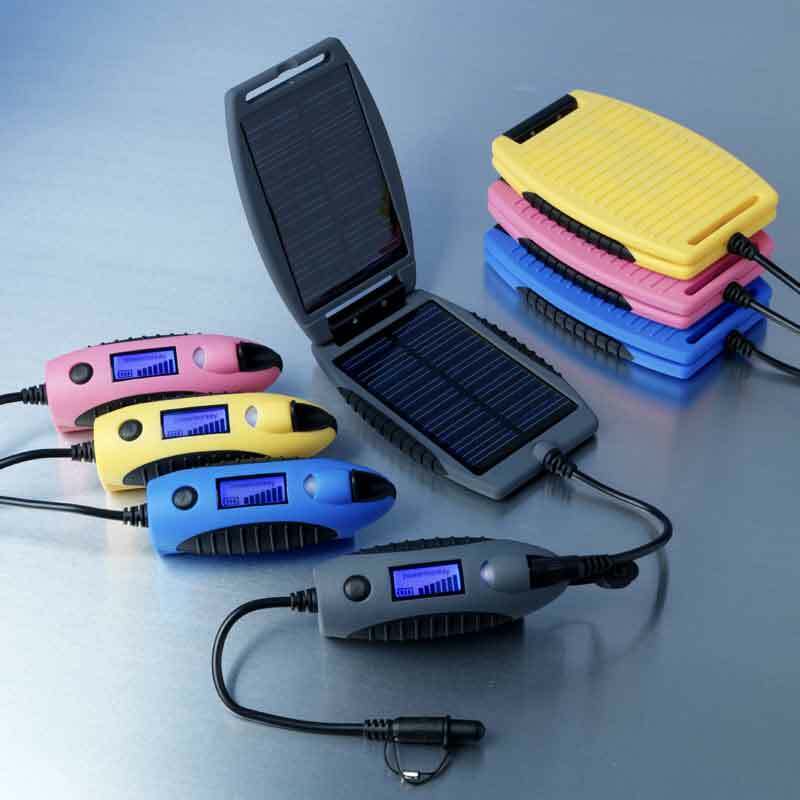 Power Monkey solar charger … very useful for the iphone and nano. If you are going to ride a motorcycle across Africa or Asia you are going to need to filter your fuel before it reaches the fuel pump or internal fuel filters. This is the number one mechanical failure on all RTW motorcycles. We used the invaluable “Steve Thomas” hand made petrol filter (made in Kenya by Steve Thomas himself out of a generic fuel filter found in a vehicle spare parts store in Nanyuki (a town on the equator in Kenya) and attached inside a converted Milton sterilizing fluid bottle with rubber seals made out of old inner tubes. People have tried pouring petrol through socks and cloth, but this isn’t good enough and the optimum method is a proper gauge petrol filter… which in the case of the Steve Thomas invention is a large generic fuel filter sealed inside a funnel contraption. Suffice to say, keep the fuel line clean, otherwise you’ll have a lot more adventure than you bargained with. Spare kit that needs to be carried in panniers. Chain cleaner & chain lube (looking after the chain, correct tension, cleaning and lubricating can extend the life of chain and sprockets by more than double). Octane booster (for those countries like Ethiopia, Kenya that sell very low octane fuel. The KTM requires 95 Octane fuel, but can be re – mapped by just disconnecting a wire under the seat for lower octane fuel. However this should not be done longer than necessary as its not great for engine according to KTM and so a few drops of the booster makes a difference. Actually, on the lower octane mapping the bike is very slightly less powerful, but barely noticeable to me. two sets of inner tubes – light and heavy duty tubes. Sometimes the valve can be ripped out of the inner tube if the pressure of the tyre is low and the tyre creeps around the rim. The only way is to replace the tube. I learnt on my sand course to change the tyre pressure for different surfaces. For instance, on sand you can lower the pressure to increase the tread footprint and get better traction. The problem with this is that it risks tyre creep and damaging the inner tube. 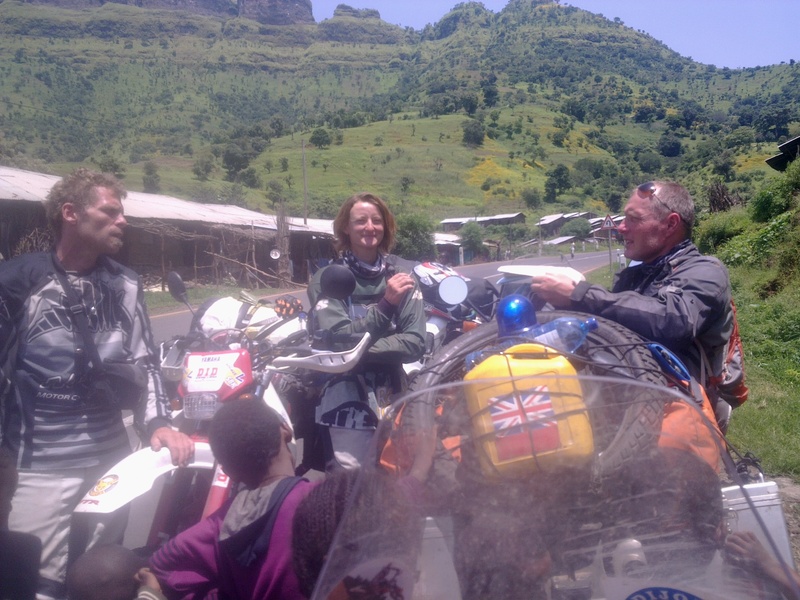 When we got to Ethiopia and Sudan border (see Ethiopia chapter) we bumped into two German riders heading south. They we desperate to find some more inner tubes as they had already used up their supply and had some tough roads ahead and so I gave them a spare heavy duty inner tube that was weighing down my panniers and they were relieved and grateful. This exchange and donation of spares and the community spirit among the RTW riders was very welcome and we benefited as much from what we received as others did from what we gave away. We gave a spare pair of brand new white Fox motorcycle gloves that Fanny sourced in China and we had not used to Spanish rider, Jose in Kenya. He was wearing those woolen gloves that hippies are fond of! Cant have that. Washing kit + vitamens (for a while until they ran out) + Chinese made quick dry towels – 1 each. Other items of hygiene kit were bought when the rider felt the other rider really needed them .. usually aimed at me. 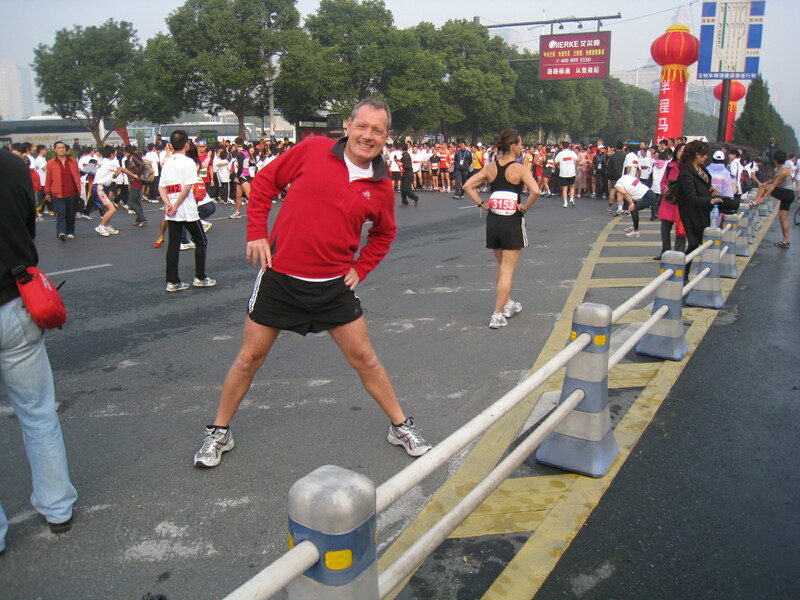 Having lived my half century on the planet with an assortment of women of differing races, sizes, needs and characters (its true) I can safely say all of them without exception feel compelled to lug huge quantities of cosmetics, shampoos, conditioners and creams with them where-ever they go, Fanny included. 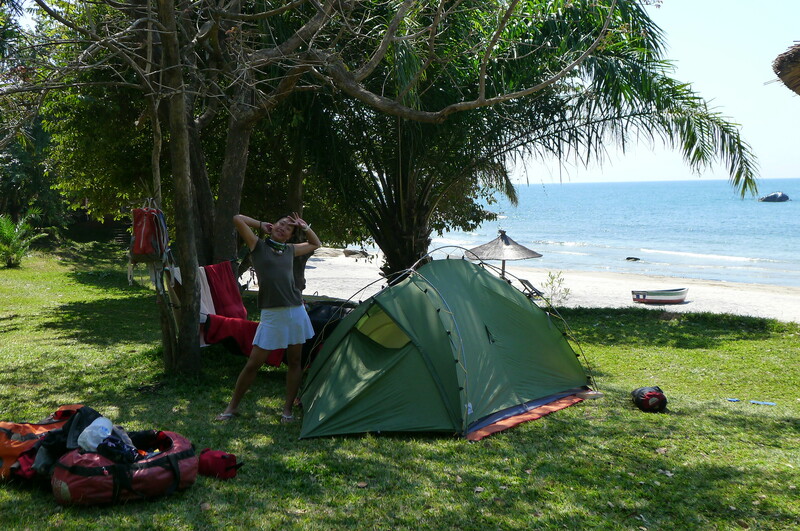 On a RTW expedition, especially on a motorcycle where weight is critical, sacrifices have to be made. I think hair conditioner is off the list of essentials… Fanny insists that it is on. We carried an extremely well stocked 1st aid kit that we bought from a South Africa pharmacy and supplemented it with various other medication – importantly, Mefliam anti malaria tablets, pain relievers and assortment of antibiotics and antiseptic creams, Malaria diagnostic kit, eye drops, disinfectant, iodine gunk etc..
Water (30 liter bag) – given to us by Dutch riders moving south in Malawi and proved to be very valuable. 30 Liters = 30 Kilograms and so the bag was rarely filled to its full capacity… apart from Sudan where we drank that volume between us every day… if not more. We also carried “Hard Bone” brand hydration back pack (sourced from China at RMB 160 each)… both very useful for ride. About 2-3 liters in each. Water sterilizing fluid… a few drops per liter. Boiling, filtering and a few drops for emergency water. However, often we just drank what everyone else drank and were fine. Also, a very cheap, small and basic Nokia mobile phone that could be used with local country SIM cards (nothing fancy.. just a phone … but because its just a telephone the battery would last 5-6 days on standby… compared to 8 hours with my iPhone 3). Also, an assortment of thumb drives, flash and memory cards; cables and chargers > This spaghetti of wires is way too heavy and annoying and I and many others no doubt long for the introduction of the universal charger and cable!. Blue Tooth in helmet communication head sets broken on first day and dumped.. sadly not robust enough for us. A new set was sent to us by a kind Chinese donor .. unfortunately these lasted a week before they broke. Oregan Slim FM walkie talkies from South Africa … quite useful when we actually remembered to charge them and turn them on… As we were not using mobile telephones for cost saving these walkie talkies allowed us to go off and do our thing and remain in contact. However, unlike many couples or groups on rides we did not really like inter comms to talk. Sometimes it would have been nice, but personally I prefer the peace and I used hand signals which Fanny generally ignored unless it involved stopping for food or a cigarette. 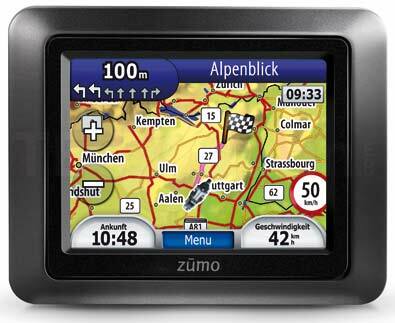 ECU Tune for KTM ECU diagnostics and mapping – free off the internet with different mapping programs for our bike. Garmin GPS world maps software bought in China (RMB 400) and also Tracks on Africa donated by Michael Heuchart from Canada where we met him in Botswana. I do maintain a facebook account, but I only use it for motorcycle groups, travel pages and as a backup repository for photographs and links to video (no friends apart from Fanny). At the beginning of the expedition I had an excellent 5 year old Canon IXUS 860, but it was lost/stolen in Namibia (see Namibia chapter). It was replaced 5 months later in Egypt with a Canon IXUS 230 HS Full HD which was bought by Fanny from a Chinese supplier and brought over by some visiting tourists from Chongqing – with some other welcome supplies such as chilli sauce, spices and Chinese snacks. We had a GoPro camera but this was stolen in Egypt – outside a mosque in Dahab of all places. Fanny now has a generic Chinese manufactured small video camera attached to her helmet. It has remote off/on switch which is better than the GoPro (which was difficult to use and know if it was actually on … every start and end of a GoPro video clip has someone peering at the camera to see if its on or off) and a laser pointer so she knows what the camera is pointing at. It is very good quality, robust and cheap at US$50… compared with US$230 for the GoPro. Protection is a contentious issue. It assumes you are going to run into trouble and that the laws of the country you are in allow it. South Africa for instance does allow personal protection equipment, but in the UK it would probably be prohibited and classified as an offensive weapon. A flick knife (illegal in the UK) shaped like a AK47 that we bought in Tanzania from a shop selling all sorts of whacky knives and swords. This was used exclusively by Fanny for cutting vegetables, mainly cabbage for la zi zhuan xin cai (a spicy fried cabbage dish that we ate a lot of across Europe and Africa). Only the catapult has been used in anger with some fruit stones fired in defensive retaliation after being assaulted by Geldoff’s feral children who assaulted us with sticks, stones and whips on the roads in Ethiopia. I don’t know why the kids in Ethiopia behaved this way… indiscipline and boredom, I suspect. Everywhere else, we are pleased to report, has been peaceful. Flatstone Bob .. to put under the side stand so bike doesn’t fall over or lean too much on uneven ground .. i.e. everywhere. Bob changed shape and size often, and is currently a four by four piece of wood from a rail track in Ethiopia for Fanny and a piece of wood cut by a fresh fruit juice seller in southern Turkey for me. Later we were given “Camel Toes” by Adventure Parts which are a really good useful and attached to bottom of the side stand. The only time on the whole trip that my bike fell over was when I parked it on soft and sloping surfaces. I never had a moving fall on the whole expedition. Fanny on the other hand…??? She now has a gold medal in picking up her bike. Her KTM? No problem apart from a few cosmetic scratches. KTM really are the bikes. I think we planned the trip pretty well. We kept both costs and weight to a minimum. – water pump kits (we were told these occasionally break down, although we had had no problems at all. As the KTM 990 evolved over its 10 year life all the teething problems were resolved by 2009 with more robust and reliable design and parts. Earlier bikes were retro-fitted with better pumps and filters during service cycles. – We were told the clutch slave is the LC8 engine’s Achilles Heal, but again we had no problems). In June 2012 the clutch slaves were actually replaced for “orange” Oberon ones at KTM UK in Hemel Hemstead where we had another routine service and the old slaves were kept as spares. A purely precautionary and dare I say cosmetic replacement. – ECU / USB cable (never needed it but good to have just in case as we had the ECU Tune software on our laptop to re-map or diagnose any ECU problems. – Carrying spare tyres on the back of the bikes is a bit heavy and a bit of a nuisance, but shipping them to the middle of nowhere in Africa from Europe or South Africa is expensive, inconvenient and decidedly stressful. 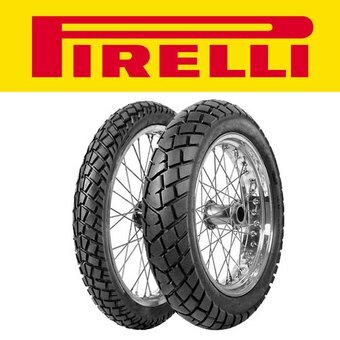 – Also, carrying them allows flexibility to swap between, say, Pirelli 50/50 tyres for general riding and the dedicated off road tyres such as Continental TCK 80s. Also, there is the price and the shipping costs and possible import duties. If you check the prices of tyres in say Egypt, Kenya, Israel or Jordan you will see they are at least double the price, if indeed they have them. – In the end I became very good at mending punctures and changing over tyres. Not initially, its hard to get the beading off and on, but eventually I got the hang of it. – Replacing the standard 19.5 liter fuel tank with a 30-45 litre after market adventure fuel tank would double the range and take a lot of the stress and worry out of not finding petrol stations or fuel shortages (Malawi, Tanzania, Zambia, Ethiopia for instance). That said carrying 10 liters in a fuel can on the back of the bike is easy, cheap and provides enough range for most situations. Also, a spare fuel can allows one to decant the fuel and filter the sub 80 octane grit cocktail served up at most African petrol stations into the tank. – more spare fuel filters from a cheaper supplier. 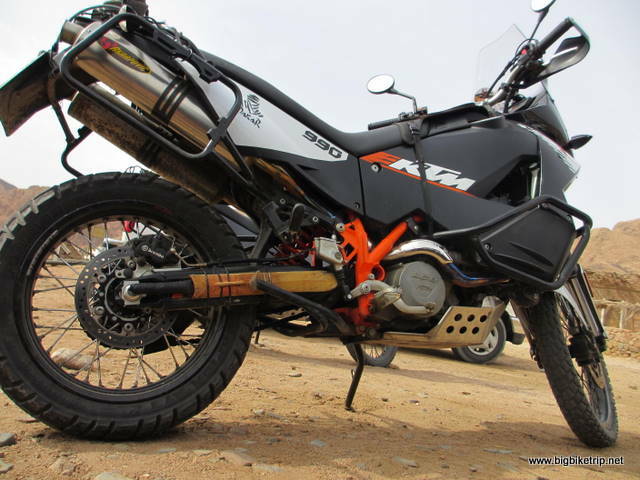 The petrol filter kits supplied by KTM Cape Town and Nairobi were ridiculously expensive for what they are and a search of internet can locate some sets for considerably less money. I didn’t think they were so important, I was wrong. They will get dirty and a dirty fuel filter will starve the engine of fuel or seep impurities into the EFi which is a bad thing and the common cause of most motorcycle problems in Africa. We got around this problem by making a very good filter (The Steve Thomas .. see above) and filtering all the fuel before it went into the tank. Better safe than sorry .. as the adage goes. – better computer and software for photo and video editing on the road. My 2007 Acer 10.1 lap top wasn’t up to this task. My old Mac 12″ laptop (2004) would have been ideal but it was stolen from Mugg & Bean in Windhoek in 2009.. Nick Dobson will remember the tantrum I had when my fellow coffee drinkers stole it and disappeared. I lost an expedition’s worth of photographs.. Backing up data and security of our things became a priority.. although old habits die hard and I continued to lose kit throughout the expedition …. much to Fanny’s annoyance. 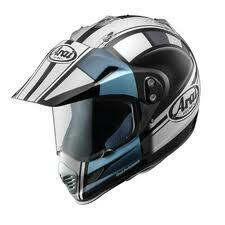 – robust in helmet communication system ( although not sure about this as I quite like the peace and quiet of wearing my earplugs and occasionally listening to my iPod …. Anyway, I am quite sure Fanny could do without – ‘OH OH OH, LOOK LOOK —A YELLOW BILLED HORNBILL’ or my singing reverberating in her helmet every 100 meters.. Most importantly bring your sense of humour. A sense of humour and an abundance of patience and tolerance is a prerequisite on such an adventure. Live in the moment and don’t worry about events that haven’t even happened yet. I loved reading about your trip. Can you give me further information about the fuel filter you used, I would love to make one myself for a trip. I have a 990 ad too! Dear Chris, we cannot really take credit for the filter as it was made while I was climbing Mount Kenya by a Brit from Durban in South Africa called Steve Thomas. As a 990/950 owner you will know the petrol filter is a real bugger to change and also quite expensive. You’ll also know once it gets clogged with sediment, dust and whatever else you inadvertently allow into the tank when filling up etc.. the bike will falter and when you open up the engine will lose power… and come back maybe when you let off throttle. Eventually engine will just be starved of fuel. So, first advise is check fuel… usually at a petrol pump its OK, but if you get fuel from plastic drums or bottles check it for octane level, colour, smell, the oily feel etc… to make sure its clean and no water or kerosene… refuse bad or suspect fuel. Second, make sure you clean the two petrol caps and remove all dust from the tank opening regularly as this can creep in .. especially gravel and sand riding. Third, (your question) filter if you can all suspect fuel going into your tank. The stocking, sock, gauze option is better than nothing, but only just… the gauge is just to big and will allow the yellow dust that clogs the filter in. So how to make the filter. 1) get a tough thick plastic bottle of at least a litre… we used a blue Milton sterilizers bottle.. or perhaps use a bleach bottle as they are tough. 5) get a petrol or diesel filter that has a diameter about 2-3 cms smaller than the bottle so that it fits in bottle with a good CM space around it. 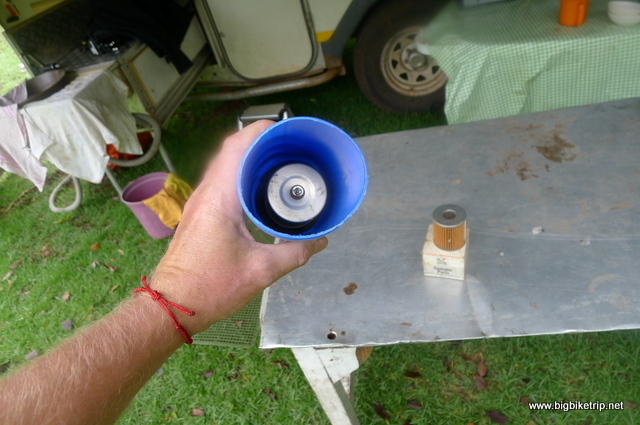 6) Put circular rubber washer you made from inner tube down in bottle towards neck…. it may mean you have to flatten the tapering of the bottle neck so you get a flat surface… this is hardest part and Steve was ingenious to flatten the neck of plastic by warming it and molding it to shape by pressing it against the hot exhaust opening of the 990… literally squashing the tapered neck flat against the hot exhaust opening. Might take a few goes to get it right. 7) the rubber washer and the petrol filter should be placed in bottle and then firmly secured using a double treaded 6-10 cm bolt … washered and bolted at each end. 8) carefully tighten up bolts so that filter is secure against rubber washer, and that there is space around the filter and exits holes are not blocked. 9) your new petrol filter will fit in securely in the tank openings and you’ll find that it allows petrol pumps to flow at normal bike filling rate… not full blast. The only thing you need to be aware of when filling tank to 100% is that there is a slight delay and it takes some practice and care not to overflow tank… especially as you cannot see in tank as you are opening. Required a bit of mathematics to estimate how much fuel you need to put in tank or you will either make an inflammable mess or not fully fill tank which is a pain. 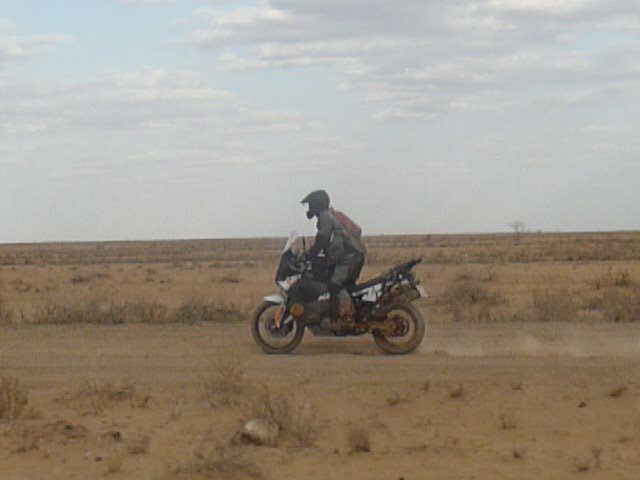 It really saved us in Africa as we saw many GS and KTMs with blocked fuel filters or jets. I was impressed you found cheapfuel filters for you 990injected engines. Could you give me more info, as I am preparing a small production of such items. George … see below. Any petrol filter will do. As big as you can get in the funnel/bottle to make sure flow is fast enough. Call Steve Thomas on +27833782517 for more info. What is the capacity of the North Face waterproof duffel bag that you use? I am planning riding from Oxford to Cape Town early next year, bike choice has been a big debate and I think I have settled on the 990 Adventure R, noticing you also decided on this model what is your feedback, have you had any mechanical issues, weak points, areas to look out for? Also keen to get your feedback on tyres how many sets did you get through for the Africa portion of your trip, what would be the ideal set up front rear? My first choice was the 1190 Adv R but with all the kit you need for the trip its almost £17k which is a lot of money, where I can pick up a good 990 Adv R for around £8k so it makes a big difference. Still debating it at the moment may in the end go for the 1190R and see how much its worth after the trip. 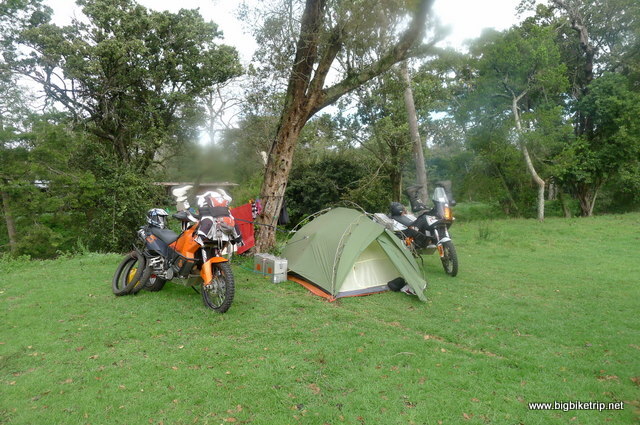 KTM adventure rider Josef Pilcher is currently on one of his epic trips in Africa on a 1190R and his feedback so far seems to be very positive. The other drawback is the person I’m riding the trip with is a short @rse (5′ 8″) and he would struggle with the 1190 Adv R as its pretty tall, everything I have read says to have the same bike for spares, tools etc so he would find it a challenge on the 1190 where if he went for a standard 990 Adv which is lower he should be fine and we could share the spares. From a British passport holders perspective which of the African countries you visited were the most difficult to gain entry? The Standard 1190 Adv. has an adjustable seat and can actually be lower than 990 Adv. Also remember you can probably sell whatever bikes you are riding, provided carnes have been signed off, and get more in SA for your bikes than in UK, especially if fitted out with panniers and GPS etc… as all these add-ons are ridiculously expensive in South Africa and there is limited in choice. A good set of Touratech panniers will get more second hand in SA than new in UK. A carne de passage is needed for most of Africa on a British plate and Egypt is the strictest . It is best to find a fixer in Egypt and Sudan as these countries can be tricky and require some local knowledge with the paperwork. We mention a couple of good fixers in Egypt and Sudan chapters. Magdi for instance in Sudan/Egypt (Wadi Halfa – Aswan ferry etc..). This route may have changed and as I mentioned before it might be worth doing the Iran, Saudi to Port Sudan which would be awesome. 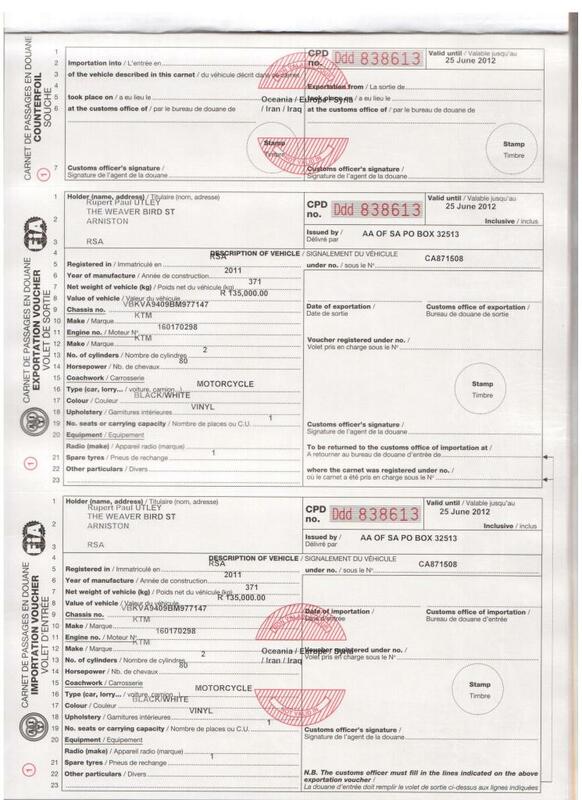 That said we loved Egypt… despite the admin and paperwork hassles. Big smile and loads of patience and all will be OK.
Hope this helps… let us know which bikes you choose. I hadn’t thought I could sell the bike in SA, isn’t there a significant import duty required if you want to sell the bike in country? If it is possible to sell in SA and the import duty isn’t horrendous then I would definitely look to go down the 1190r route as I agree it looks to be the best bike for the Job. With regards to route I think the safest route at present is to take a ferry from Turkey into Egypt however there isn’t much information on companies who are operating from Turkey to Egypt several were before the troubles in Egypt and Syria but they seem to have stopped! This part of the route is proving to be an issue as the only other route is through Morocco, Tunisia, Libya and Egypt which isn’t ideal at the minute due to the unrest in Libya, I was planning to go through Syria, Lebanon and Israel but that route is now closed due to the troubles in Syria. We are planning on departing in February 2014 from Oxford, will keep you updated on which bike we go for but the import costs into SA will have a baring on the eventual winner. Thanks again for all the advice its so useful having the ability to learn from your experiences and get your 1st hand feedback. 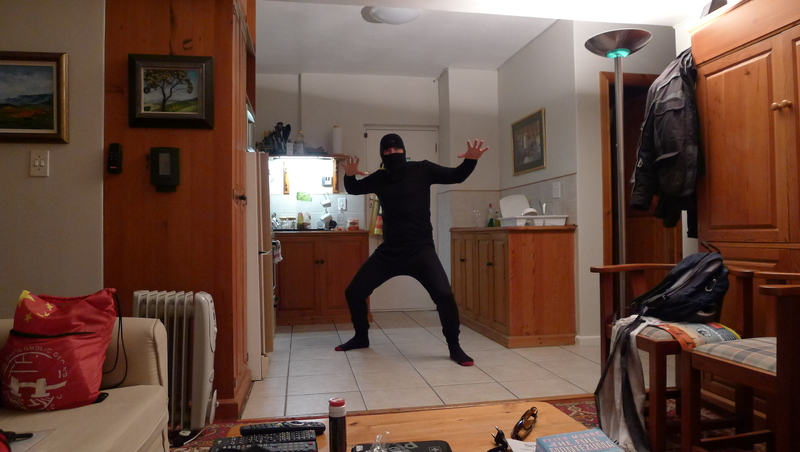 hello adam, a most excellent blog about your adventures. i specifically linked to it from the CFMoto US site. we are now a CFmoto dealer to go along with our Suzuki Franchise here in the US. so i was looking for more on the Tech side of your experience with the 650s that you used. but couldn’t find a write up on that part of your “bikes & equipment”. just on the KTMs. how was your experience with them? (we are currently only offering the offroad stuff but have the street stuff on order to be received in July or august. feel free to speak your mind. i would like all criticisms or accolades on the product. we are excited to get the NK and TK here. thanks much and ride safe! Hi Dan , this is Rupert. We rode the TR 650 for 13,000 kilometers across China. I really liked the bike, a few issues and I actually did an appraisal for CF Moto in Hangzhou and said I would give them a chance to respond and make any alterations before I posted. Pros: -very nice engine, especially for a 650. The straight twin is great. -pretty decent brakes, not brilliant but for touring absolutely fine. -seat a bit uncomfortable and cheap… I had to use a sheepskin and that helped a lot. Fanny was OK with her seat. -sitting position a bit cramped for 5 foot 10 and above … I am 6 foot and my knees were pressed up the whole time against the tank, but due to very good riding gear (Rev’Ít Adventure) the padding in my knees provided cushioning the whole time. cheap and tacky indicator switch… very vague. Light switches not great but a bit better. needs a lot of servicing when new, and service interval to keep bike in tip top condition is rather frequent, that said the type of oil and oil filters used were quite cheap and easy to find. -for first 5000 kilometers it was difficult to select 2nd gear on my bike, although Fanny didn’t seem to have any problem on her bike. This got better, but there was still a bit of an issue with my bike. -no where to fix GPS… we had to improvise and re-wire. -the black perforated plastic that looks like speaker covers in the cockpit are very fragile and break. Overall I would say its an excellent touring bike for the money, superb engine, nice handling, good power throughout the band for a 650…. however a little let down on some of the finish, plastic bits, the cheap mirrors and switches. I grew to like my bike very much. 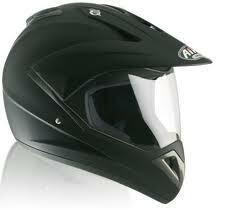 As for the 650NK …. I like it very much, looks great, handles well. I wish CF Moto would give us one for Hong Kong where it would be a perfect street bike. No dealer here. It would also be great if CF Moto put the engine in an adventure style bike like a Kawasaki KLR… would be awesome. Excited to see what collaboration with KTM will bring. great review. actually what i would expect. we notice on the ATV and UTVs similar issues. (overall a good product with a couple hiccups in the fit, finish, and QC dept.) and for the price, hope they do well for us. in the US, it has been a very good experience dealing with the North American Headquarters and CFmoto in general. we are hoping it continues. Cheers! En primer lugar,… Felicitaciones a ambos por todos los consejos y los maravillosos viajes, en estos momentos me encuentro cambiando mi actual moto (suzuki v-strom 1000 año 2011), y me gustaría una kTM 990, BMW 1200 gs, o yamaha super tenere 1200, me gustaría saber tu opinión de experto, pues quiero una maquina que no falle en largas travesías,…mi intención es viajar unos 4000 km. por diferentes tipos de pistas. Desde La Serena Chile, un enorme saludo y agradecimientos por tus valiosos consejos. Almost James Bondish with your escapades….even down to the exotic girlfriend. Exotic girlfriend ??? Fanny?? … It’s me wots exotic… Pink with red spots!!! What the heck is a “catapult”? A slingshot? Whats a sling shot?… a maneuver to escape the Earths orbit? Yeah, that too. A catapult is this giant contraption that hurls pumpkins and watermelons 500 meters. Huge stones if they are serious about breaching a wall. A slingshot will kill squirrels or deter feral children, dogs, pigs, whatever. Unless of course you use the kind they use in the Middle East, i.e. Da-vid vs Goliath–in which case it will kill you!